Virunga National Park covers an area of 7 active volcanoes with a high diversity in plants and animals. Vulnerable or endangered species that live here include the hippopotamus, the mountain gorilla, the lowland gorilla and the eastern chimpanzee. Covering 7,800 km2 , the Virunga National Park lies in the eastern Democratic Republic of Congo, bordering Volcanoes National Park in Rwanda and Rwenzori Mountains National Park in Uganda. It was established in 1925 as Africa's first national park (then called Albert National Park), in order to protect the mountain gorillas. From the mid-1980s poaching and the Congo Civil War have seriously damaged the park’s forests and its wildlife population. The site has been In Danger since 1994. Since then 130 park rangers have been killed in the line of duty. Varying in altitude from 680 m to 5,109 m, Virunga has a wide range of habitats: from savannah and marshlands to permanent glaciers and snow. It covers the western shores of Lake Edward, known for its 20,000 hippopotamuses. The Ruwenzori Mountains lie on the Ugandan border and rise to alpine meadows and a glacier, while Nyiragongo and Nyamuragira are the most active African volcanoes with substantial associated lava plains. From the moment that I became aware that it’s feasable at the moment to cross the border into the Democratic Republic of Congo and visit Virunga National Park, I simply had to do it. I booked myself into the comfortable Mikeno Lodge, arranged transport from Kigali in Rwanda to the Congolese border and signed up for a gorilla trek in the park. This is one of the earliest WHS (1979) and it has been praised in superlatives for its montane landscape, volcanism and biodiversity. The site is also one of the 50 remaining WHS that are still unreviewed at this website. The park has been faced with “an almost uninterrupted series of trials” since the mid-1980s, ranging from the influx of one million Rwandan refugees in its vicinity to the oil exploration by SOCO. The latter is the subject of the acclaimed but rather unsettling documentary Virunga (2014), which I watched on Netflix a week before I headed out there. “Congo is safe now”, my Rwandese driver said while we were passing empty refugee camps near the border. One of the first remarkable things upon arrival I found that the park entrance lies in a quite densely populated area, and next to the main road that goes north. The road is in a terrible state, consisting of nothing but old to very old lava and potholes. It is used however by trucks (even oiltransporters), buses and moto-taxi’s that bump from left to right. Everywhere there are people: walking beside the road, living in villages or pushing the ubiquitous East-Congolean ‘wooden scooter’ called chukudu. After settling in at the lodge I saw my first ‘new’ monkey species rightaway. A number of blue monkeys have chosen the trees around the lodge as their home. They peek at the clients while they are eating, and drop nuts on them as if they are annoyed by them walking by. Staff showed me the entrance to a trail that I could walk unaccompanied. I expected it to be an easy interpretative trail that I know of other nature lodges, but this was Congo-style. Probably they think that if you’ve managed to come here you can take care of yourself. It was quite slippery at the start, and I learned quickly that the ants like to climb your legs when you stand at the same spot for a short time. It turned out to be an hour’s hike through the dense forest, on a trail that branched a few times (but the staff member had said: keep going left!). I saw no less than 3 groups of black-and-white Colobus monkeys. And I startled a bushbuck on the path, a rather rare sight I heard later. For the next day I was scheduled "to do the gorillas". The critically endangered Mountain gorillas can only be found in Bwindi and Mgahinga (Uganda), Volcanoes NP (Rwanda) and Virunga. Among these, Virunga offers the cheapest option for a permit at 400 US dollar ánd has the highest number of remaining gorillas (480 out of 900). 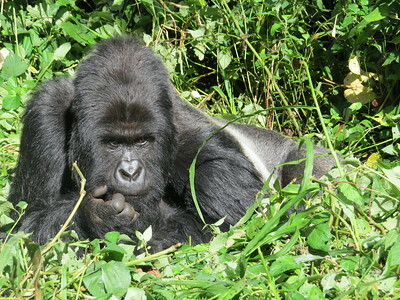 The area I visited is called Bukima, and I was assigned to a gorilla family named Humba. They consist of 2 silverbacks, 2 adult females, 1 subadult, 2 juveniles and 2 babies. Gorilla trekking can turn into quite a strenuous hike, but I had read beforehand that time varies between 1 and 3 hours to find the gorillas here in Virunga. There were 12 people visiting today (Dec 31, 2015), and they were divided into 3 groups to visit different families. The park rangers use trackers to locate the families, and our group was only accompanied by a guide and 3 trackers. They were unarmed, except for one machete between them to hack away the bushes. Our walk started in the farmlands just outside the park borders. It was easy going and virtually no climbing was involved. Already after 15 minutes our guide told that the trackers had found the Humba family. So we walked 10 minutes more through the fields (saying “Bonjour” to the bewildered farmers), crawled between the wires of a fence into the park and just some 5 minutes of bushwacking later we were with our first two gorillas. I may just have described the easiest gorilla trek ever! The beasts were just within the park’s borders, maybe 50 to 100 meters away from the fence. We then had to put on surgical masks – this is another difference between Virunga and the other parks that organize gorilla treks: the Congolese are afraid that diseases may be spread as they already had to deal with 3 gorillas with tuberculosis. ‘Our’ gorillas were just lazing about, fortunately in a relatively open area so we had good views and excellent photo opportunities. Officially a distance of 7 meter should be kept, but there is just not so much space between the thick bushes. Most of the time we were at about 3 meters distance, and one big guy startled us by sitting pontifically 1 meter in front of us. A little tension arose among the four tourists, but the guide managed to keep his and the gorilla’s calm by making soothing noises. In the end he just walked away and we could move again too. You’re allowed to stay with the animals for one hour. After 45 minutes they were moving to another place, and we followed them on their trail. I think it’s needless to say that it was a very worthwhile activity, and what a way to finish the year 2015. We came up much closer to the gorillas than I had expected. But above all the surprise is that they stay so calm and relaxed. 2016 started with a blast too: a group of chimpanzees had made their nest in the grounds around Mikeno Lodge, and we were able to ‘track’ them early in the morning of January 1st. This was much harder work than the gorillas, as they move quickly (leaving a trail of devastation and half-eaten fruits behind). But in the end we managed to catch up with them and have good sightings of the whole group. Unfortunately I had to move on after two days in this fascinating place. Several of the other guests at the lodge continued with an envying overnight trek to Nyamuragira Volcano’s lava lake - just another world class feature of this topnotch national park. impact of the war and civil conflicts in the Great Lakes region. Virunga NP lies in the far east of Congo, about 1.5 hour north of Goma. How to get there is explained comprehensively on VisitVirunga. Damaged in War since WWII: "Great Lakes Conflicts" - Rwandan Genocide (1994) First and Second Congo Wars (1995-6 and 1998-2003), Kivu Conflict (2004-10). Mines, Poaching, Illegal wood cutting/charcoal burning, squatting. "The forests of Virunga NP, home to the endangered mountain gorilla, were badly damaged by the demands for firewood and charcoal made by the refugees. Two years after the arrival of the refugees 105 km2 of the park's forest had been affected, of which 63 km2 had been razed." (Wiki). Recently Active Volcanoes: Nyiragongo and nearby Nyamuragira are together responsible for 40% of Africa's historical volcanic eruptions. There were major events in 1977 and 2002. Mt Nyirangongo is a "Decade Volcano"